Apple allegedly is looking beyond the iWatch wearable device and may be creating a new health and fitness ecosystem modeled on its successful iOS App Store, claims a mobile health executive who recently spoke to Reuters. Similar to the iOS App Store, this new platform may allow companies to develop their own mobile medical applications that could tie into Apple's iWatch wearable device. As part of iOS 8 later this year, Apple is rumored to be launching a new Healthbook app, which is expected to serve as a repository for health-related data acquired from a variety of sources. Based on the breadth of data the app appears to be able to track, it is unsurprising that Apple will be looking to open up the ecosystem to third parties to help users fill out all of the various content areas. One company that could benefit from an Apple health and fitness ecosystem is Nike, which has scaled back its work on its Fuelband hardware to focus on expanding its software-based NikeFuel platform. Though Nike CEO Mark Parker would not directly comment on specific plans with Apple, Parker did note in a recent CNBC appearance that Apple is a longtime partner and that he is "excited about where that relationship will go forward." Much of today's report focuses on Apple's health- and sensor-related hires over the past several years, most of which have previously been detailed and which have been focused around non-invasive monitoring of vital health parameters such as sleep, oxygen saturation and blood glucose levels. Apple has hired talent from notable companies such as pulse oximetry company Masimo, medical sensor company Vital Connect and Philips Sleep Research. Apple's latest reported hire is MIT researcher Eric Winokur, who worked on ear-worn devices for monitoring blood pressure and heart rate. Information about Winokur's hiring surfaced alongside a sketchy rumor claiming Apple is planning to launch an EarPods model with integrated heart rate and blood pressure sensors. While a new Tumblr blog post reveals that the claim was indeed fabricated, Apple patent applications suggest the company has indeed considered the integration of biometric sensors into its headphone line in the past. Apple's sensor-laden iWatch has been rumored for several years, with most recent rumors suggesting that it may debut late this year. It is not expected to be unveiled at the company's Worldwide Developers Conference set for early June. Apple is about to explode on the world again me thinks. I could not agree with you more. The health industry is HUGE and growing. Everyone cares about their health... even those who say they don't... should. Apple is about to give them a great reason to start paying attention. Looking at this image, I'm starting to think there is no iWatch. But rather, a series of iRings. One for each finger. 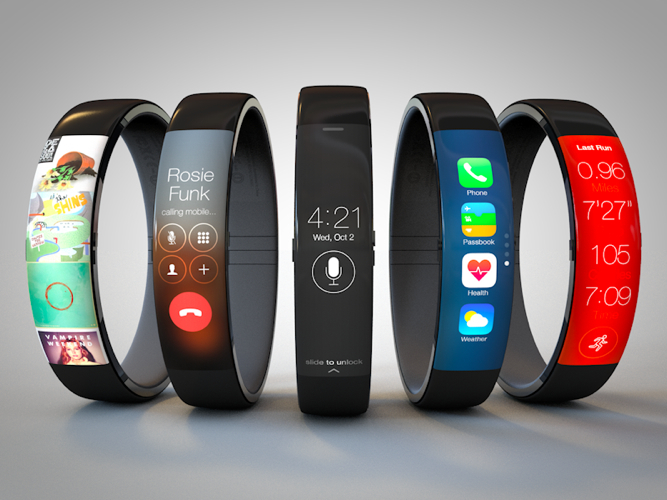 If the Apple wearable looks similar to these mockups, I am interested. A watch, no thanks! Pandora, your box just arrived. Apple may be making a move to bring more than a workout tool to the market. As we are subjected to an increasing array of advertisements from prescription drug companies whose apparent goal is to get every American as a permanent consumer of their products. The "lifestyle" approach to these ads are convincing enough to get the fittest amongst us to wonder if our lives would not be better with one of these drugs. Back to Apple which has millions of consumers of their products many of which have developed compulsive habits of constantly checking their iPhones and are never without them. Why not introduce a product that deepens that behavior but instead of social media this time a person can constantly check the heart rate, blood sugar, blood pressure, etc... I can see it now people in a meeting all looking to see their heart rate when they should be paying attention. Will this new device have the same ill effects on social norms the way the iPhone and other smart phones have already or will it be solely aimed at sporty types training for the Olympics? My guess is the health industry will see this as the greatest profit boom in history. The iRing to rule them all. So alleged app store ecosystem on an alleged device. Got it. I see a big invasion of privacy meltdown coming. Every move you make will be tracked. All your vitals tracked. Apple security issues are really getting bad. Just imagine all this information in the wrong hands. If health care providers accept integration of data from apps that are collecting vitals and other health related information this could be a huge market. No thanks personally. Our health records are already often at risk regardless of HIPAA Compliance. I really have no desire to open up that issue further.